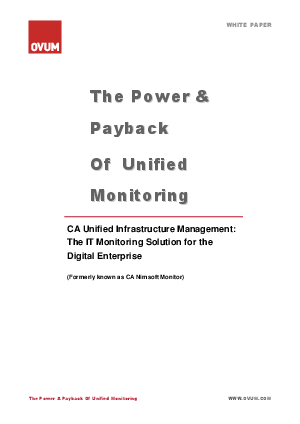 Monitoring IT operations is made costly and inefficient due to the presence of multiple, complex monitoring solutions. These legacy systems have a silo view of the IT environment creating unnecessary complications when trying to resolve infrastructure and availability issues. While system administrators are attempting to resolve these problems the customers and their business are suffering. For hosting providers there is the threat that customers will walk to cloud outsourcers. There is therefore a need for a single solution that can provide timely support for new applications and technologies, to help reduce IT operational costs and complexity, and to put customer need at the center of operations. In addition there is the problem of managing remote data centers, whether as a managed host provider or an enterprise with locations in remote regions of the globe. IT operations require a monitoring solution that is easy to manage and configure, with new system components added remotely into live systems – as simple as plug and play. A multi-tenant system is also ideal for managed host providers, making the task of managing customers cost effective, exploiting virtual environments. The cost to the business of not monitoring can be substantial, but in order for the tools to achieve the benefits of monitoring the tools must be easy to use and configure to meet business requirements, such as reports and KPIs. This paper outlines the benefits of CA Unified Infrastructure Management and how it can have a positive impact on your business, download this paper to find out more.